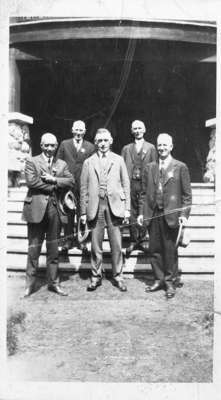 Black and white negative of a photograph of members of the Whitby Public Utilities Commission at a conference in Muskoka, ON. The photograph was taken on the front steps of the Bigwin Inn. From left to right: George Every, John Bateman, Arthur Allin, Andrew Ross, William J. Luke. The conference was held from 24-25 June 1926 at Bigwin Inn in Lake of Bays, Muskoka. Public Utilities Commission in Muskoka, June 1926, Photographer Unknown. Whitby Archives 08-006-022.